The Mirror Dinghy World Championships were first conducted in 1976 and are held roughly every 2 years. Australia's first World Championship was secured by Paul Eldrid in 1987, and its second by a young Tom King in 1991. King would later go on to win a gold medal in the 470 class at the Sydney Olympics. However, in the ensuing 26 years, Australian crews finished 2nd no less than 4 times but the trophy eluded Australian hands. For the 2017 edition of the Mirror Dinghy World Championships, racing would be conducted by the Restronguet Sailing Club in Cornwall, England on the scenic waters of Falmouth Harbour. There is a rich maritime history there and the harbour is guarded by Pendennis Castle - constructed in 1540 by Henry VIII to protect his navy from the Spanish. So not without some trepidation, a small but keen team of 7 Australian crews made their way to England to compete. Led by WA champions Simon and Tyson Barwood, who were 2nd two years ago at the Worlds in South Africa. The team included fellow WA sailor Richard Rowell and his 3 daughters Rosie, Matilda and Tessa with 2 boats. Another 4 crews from NSW arrived with Woollahra stalwart Stan Bland and his wife Penny, and from Balmoral Sailing Club, Australian ladies Champ Tara Wilson with Class President Celia May, Gavin and Oliver Cooke and reigning NSW State Champions Cullen and Rowan Hughes. 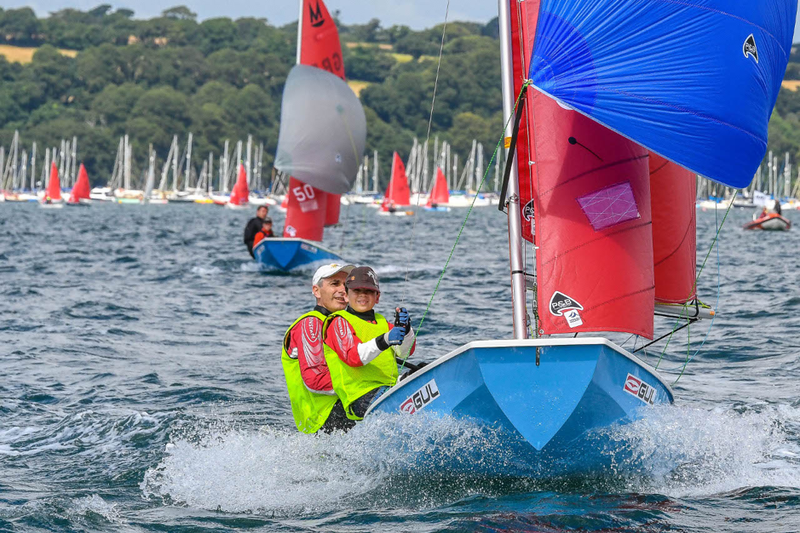 A pre-Worlds regatta for the UK national Championships was held over 3 days in very fresh conditions and was won by UK sailmaker Dave Wade and daughter Imogen. There was a strong showing from the Australians with Simon and Tyson Barwood improving throughout the series to secure second place and Stan Bland winning 2 heats to finish 4th. Tara Wilson was the top performing ladies boat in 9th taking out the UK Ladies trophy. Despite being mid-summer, the weather delivered plenty of liquid sunshine with crews lashed by horizontal rain and temperatures in the mid teens. A fleet of 51 boats lined up for the worlds with crews from 6 nations including a container of boats from South Africa who had provided winners of the previous two Championships and a strong U.K. contingent. The Invitation race saw a reduced fleet line up for an afternoon race in enjoyable but challenging sailing conditions. With flat water and little traffic combined with 5 metre tides and 10-20 degree wind shifts. Hughes, who had skipped the pre-worlds regatta as it was held during the Australian school term, lined up for their first race. Despite a new boat and unfamiliar conditions, they pulled away to record a convincing win. Fear of bad luck led a number of the fleet to withdraw from the race prior to the finish but no such conventions bothered Hughes as his years as an actuary and knowledge of statistics and probability leaving little time for superstitions. The first day of racing saw 3 heats in moderate shifty conditions and set the scene for the regatta. After waiting an hour for the breeze direction to settle down, racing finally got underway in a South Westerly on a windward leeward course. Heat 1 saw Wade lead around the 1st mark and sail away to a convincing win with Hughes in 2nd and Youth sailors Scartlett Shepherd & Imogen Bellfield in 3rd. Heat 2 ended up being crucial in the end results as Wade once again led across the line from Hughes (by half a boat length) and Barwood but was scored OCS. Heat 3 saw a win to Hughes with Wade and Barwood in 2nd and 3rd. The next 2 days of racing saw 6 races sailed in gradually increasing breezes and more consistent results from Hughes. They were rarely outside the top 10 at the first mark, made few errors upwind in the shifts and were able to use superior speed downwind to pass. They scored 3 wins, 2 seconds and a 4th to remain firmly at top of the leaderboard. By the second last day and with 3 heats remaining Hughes only need a 5th or better in one of the remaining races to secure the title. The boats took to the water in the first of the days 2 races in fresh to strong conditions with gusts to 28kn over a triangular course. Barwood led at the final mark but capsized on the gybe giving Hughes the lead. Hughes dropped his spinnaker to safely execute the gybe to finish 2nd and secure the title. Wade capitalised with a win coming from behind Hughes on the final spinnaker reach to leave the fight for 2nd place wide open. The strong breezes saw an improved showing from the Cookes to win boat of the day with a 3rd and 4th to give them a shot at a top 10 finish. The final day's sailing saw heat and a return to light shifty conditions and another win by Wade to secure second place over Barwood. The light winds played into the hands of the UK and Dutch boats in 10th and 11th overall leaving Cooke to secure 12th place in a tightly fought close to the regatta. Wilson and Bland both had great results with top 10 places in some of the heats, but the level of competition in the fleet was such that this left them in the top 20 overall, a testament to the strength and depth of the Mirror fleet in Australia. After over quarter of a century, the World Championship trophy would finally be returning to Australia. Cullen Hughes sailed Mirrors as a boy before going on to sail Fireballs and more recently 505s. He returned to the Mirrors two seasons ago as his two sons began showing an interest in sailing. 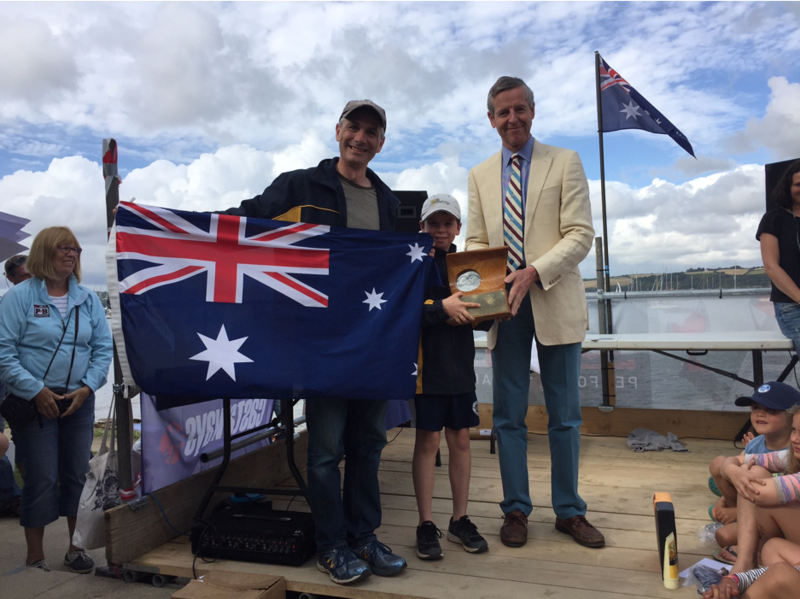 He is looking forward to defending his title with younger son James at the next World Championships to be held on Sydney Harbour from Woollahra Sailing Club in January 2019.